Trained Bees Sniff Out Bombs | OhGizmo! 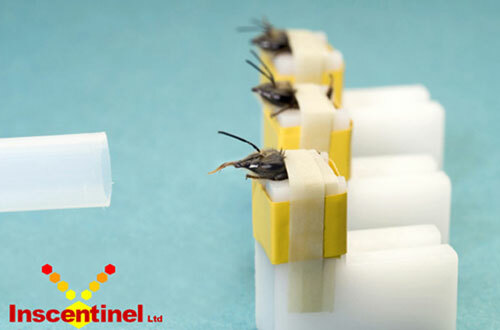 Inscentinel is a company developing better methods of sniffing out explosives, albeit in a very strange way. It takes bees, yeah the real live stinging sort, and straps them down onto a cartridge inside a portable vapor detector. The bees are trained to stick out their tongues when they smell certain scents, presumably the smell of explosives. A camera trained on the bees shows if their tongues come out or not. If you happen to be packing a dozen roses, I wonder if false alarms may be possible. I have to wonder who drew the short stick at the plant to get the job of taping bees down onto cartridges. Inscentinel says that the bees are happy with their sniffing tasks and that only healthy bees work effectively. They can talk with the bees? How do they know that the bees are happy.